Although there are numerous storage companies in La Mesa (and across East County), it's been shown that portable storage provides for the most convenient storage solution for most residents. 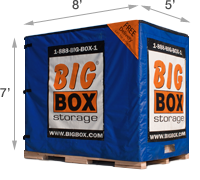 Big Box Storage provides storage unit pickup and delivery and also a best rate guarantee. 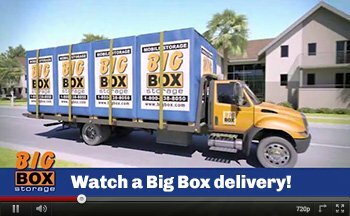 View the company's online infographic for additional details explaining the benefits of the Big Box Storage service in zip codes 91941 and 91942. The company also offers services in the remainder of East County including storage in El Cajon as well as storage in Lakeside. For a detailed overview regarding pricing, please visit the rates and promotions page. With rates starting as low as $64 per month, you'll find Big Box Storage to be not only convenient, but economical as well. As first stated above, all rates come with a 110% best rate guarantee. Find a better rate with another La Mesa storage company and Big Box Storage will beat that rate by 10%. La Mesa's best storage value is only a phone call away - 619-436-5020. Scheduling a delivery for a Big Box unit is quite simple by using the company's online scheduling form. Select whatever date and time work best for you. At the selected time, a Big Box Storage staff driver will deliver one or more storage units to your La Mesa address. Pack up the delivered Big Box(es) at your pace. Once you've finished packing them, the company will return to pick it/them up and take them back to the company's La Mesa area storage facility. Customers will be pleased to note that the facility offers numerous security defenses including video surveillance, motion sensors, onsite staffing, perimeter gates as well as perimeter alarms. Questions regarding the company's service? Ready to schedule a Big Box delivery? Contact a Big Box Storage representative by calling 619-436-5020. Staff members are available seven days a week (major holidays excluded) between the hours of 7:30 am and 6:30 pm. Thank you for your interest in Big Box Storage - La Mesa's portable storage company.